In 2008, dancer and entertainer Josephine Baker was honored at Madame Tussauds in Berlin in this iconic pose, her "banana dance" from her 1920s act with the Folies Bergère, based in Paris. The American-born Baker went to Paris where she had far more success than she did in America. She became a French citizen. During World War II, she worked for the Red Cross and the French Resistance. When, in the 1950s, she encountered discrimination in the United States, she became active in the early civil rights movement. Josephine Baker became noted in the mid-1920s after she moved to Europe. One of her most famous images is this one, which Madame Tussauds museum in Berlin, Germany, copied for a wax statue of Baker in 2008. This costume was one she wore from about 1926, when appearing with the Folies-Bergère. When wearing this costume, she appeared on stage by climbing backwards down a tree. Josephine Baker poses on a tiger rug, wearing a silk evening gown and diamond earrings, in a typical 1920s image of wealth. Josephine Baker nurtured an image of herself quite contrary to the images of her childhood in East St. Louis, Illinois, where she survived the 1917 race riots. Josephine Baker is shown in 1925 with her iconic pearls. During this period, "La Baker" was working in Paris, appearing with the jazz revue La Revue Nègre and then with the Folies-Bergère, also in Paris. Photographs of dancer Josephine Baker from the 1920s frequently featured her wearing pearls. Josephine Baker, an American-born dancer who found success in Europe in the 1920s, achieved her fame at the same time the Harlem Renaissance was blossoming in America, and women like Billie Holiday were becoming famous in the jazz world in the United States. Josephine Baker shows off her famous smile -- and signature opulent dress, here with fur -- in a 1928 portrait. Josephine Baker used her dancing and comic talents at the Parisian Folies Bergère after her jazz revue failed. She is shown here in one of her elaborate costumes, often -- as with this one -- made of feathers. In this 1930 photograph, Josephine Baker is wearing a dress decorated with feathers -- a signature style during her time with the Folies Bergère in Paris, where she was a comedienne as well as a dancer. Josephine Baker poses in 1931 with her pet, tame cheetah, Chiquita, in a formal portrait. Her dress picks up the tones and spots of the cheetah. Josephine Baker takes her pet, tame cheetah, Chiquita, for a walk in this news photo from 1931. Josephine Baker, the American-born singer and dancer who achieved most of her success in Europe, worked for the Red Cross during World War II, contributing intelligence to the French Resistance. She is shown here in a visit about 1950 to Buenos Aires. Josephine Baker. wearing an elaborate costume reminiscent of her days with the Folies Bergère in Paris, entertains another generation with her singing and dancing. 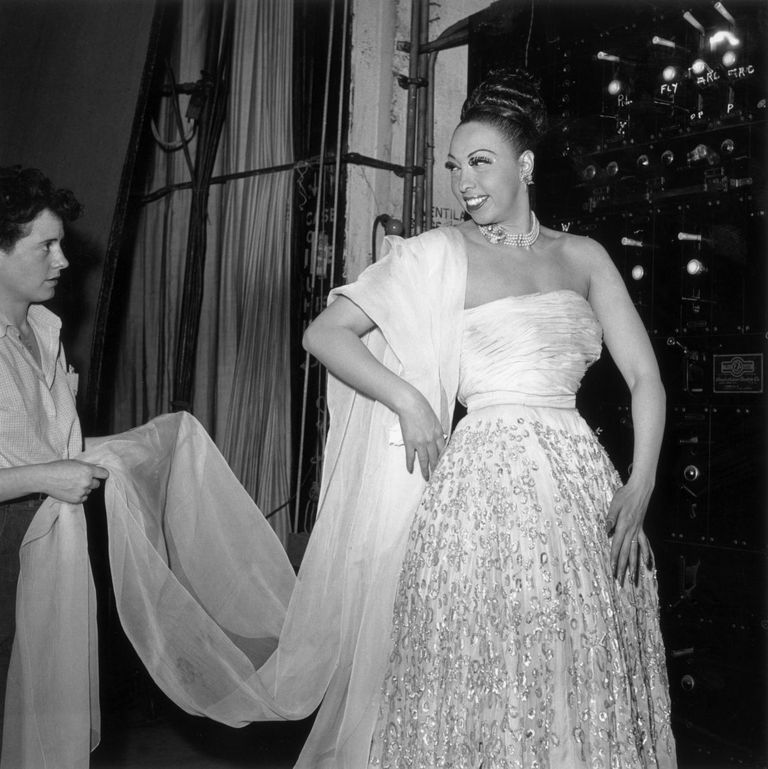 Josephine Baker flashes her famous smile, this time backstage at a performance in Los Angeles in 1951. While she found more success in the United States than she had found at the beginning of her career, she also found that racial discrimination was still alive and active. In October of 1951, entertainer Josephine Baker entered the famous New York City nightclub, the Stork Club -- and was refused service because of her color. The NAACP staged a protest outside the Stork Club in reaction, and Josephine Baker became active in the civil rights struggle of the 1950s and 1960s. Still glamorous in her mid-50s, Josephine Baker wears a strapless evening gown and a fall with her hair pulled back, a cape draped over her arms, in this 1961 studio portrait. Though Josephine Baker's World Village fell apart in the 1950s, she continued to entertain on stage. This photograph was taken in Amsterdam, where she performed on November 16, 1960. Josephine Baker, better known as a dancer, singer and comedienne from the 1920s, was a French citizen after emigrated from the less-welcoming United States. During World War II, Baker worked with the Red Cross and fed intelligence to the French Resistance. In this photograph, she looks back at wartime memorabilia collected during that time. About 1973, as she was staging yet another comeback, Josephine Baker performed for the Red Cross Gala in Monte Carlo. Baker had worked with the Red Cross during World War II, when France, where she had taken citizenship in the 1920s, was taken over by the Nazis.